Edge of awareness: GM's system outlines a roadside through the fog. 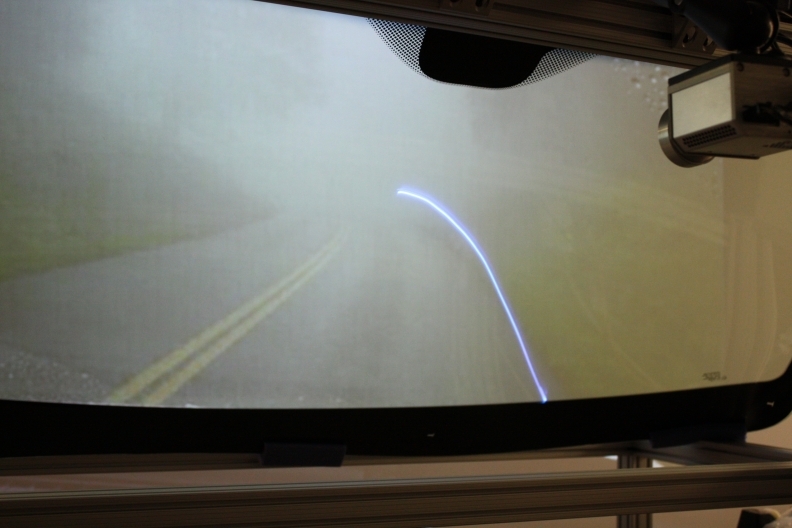 DETROIT -- General Motors Co. is developing a windshield display system designed to outline the edges of roads in fog and highlight a deer before it crosses into traffic. The system works by collecting information through vehicle sensors and cameras and projecting laser-generated images onto the windshield. It can also highlight road signs and tell drivers when construction is coming or when a desired exit is approaching. GM currently has no plans to put the system in any vehicles, but some of the technologies it involves could show up in upcoming models, said Thomas Seder, group lab manager for GM R&D, in a statement. “We have done testing on a number of drivers and their performance is better relative to head-down systems that are commonly used in vehicles today,” Seder said. GM is working with universities including Carnegie Mellon University and the University of Southern California on the system. GM has heads-up displays on some existing models that show vehicle speed and other information on the windshield.